As I’ve mentioned previously my new apartment leaves much to be desired and my landlord is something of a nutcase. I’m slowly trying to get the necessary changes made though and since I see my landlord almost on a daily basis, (not by choice) I have plenty of opportunities to pester him about what needs to be done. I have no clue why he’s around here so often other than that he’s a bumbling, nosey man who likes to have people to complain to. Every day, EVERY DAY, he tells me how expensive things are and how the electricity is run by the mafia and how I need to turn off all the lights when I’m not using them, (why? Because it’s so expensive… the mafia… so expensive!). I generally just nod my head and try to have an excuse on hand about why I can’t stay and chat with him for hours on end, like I have to go dig a hole and sit in it. As Landlord hobbled off, head in his hands, I thought that was the end of any hope for a new shower. Then, a few days ago, Landlord showed up on my doorstep with a Shower-Fixing-Guy of his own, who fortunately sided with me and backed me up when I said the whole shower needed replacing. Once again, Landlord left with tears in his eyes and head in his hands. Fastforward to today when I just heard today a knock on my door that actually made me happy, (and glad I didn’t pretend not to be home). It was Landlord accompanied by Bathfitter Guy! Wooohooooooo!!!! I’m getting a whole new shower!!! It will take a couple weeks to happen, but I’ve waited this long, a couple more weeks won’t hurt. I’m still in disbelief. 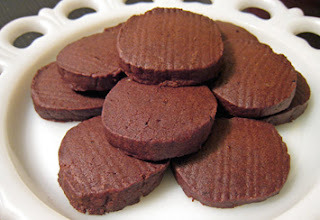 In celebration, I thought I’d showcase a few more Dorie recipes. It’s been a while since my last Dorie post and I don’t want you to think I’ve stopped using my favourite Baking book, so here are some more amazing Dorie goodies: Madeleines, Chocolate Madeleines, (with lime zest!) 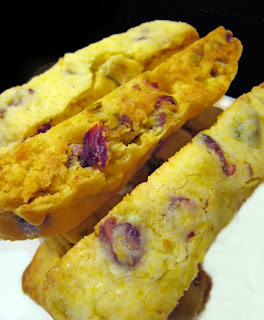 Salt and Pepper Cocoa Shortbread and Lennox Bicotti, (I’ve already made the original almond version so this time I substituted cranberries and pistachios for the almonds). Posted by Brilynn at 7:44 p.m.
My dear Brilynn. You should just come to Florida for a nice vacation. We have kitchen lights and a clean shower. I'm so glad you finally wore your landlord down and are getting a new shower. As a once again renter, I am so thankful that my landlord lives in the city 20 miles away and hasn't batted an eye when I told him the hot water heater AND the blower on the house heater needed to be replaced. Good luck and Dorie goodies always make a even the worst situation pretty darn good. Brilynn, I so love your stories. I feel for you having to wear flip flops in your own shower! Good luck with the new one and hope it comes sooner than later! 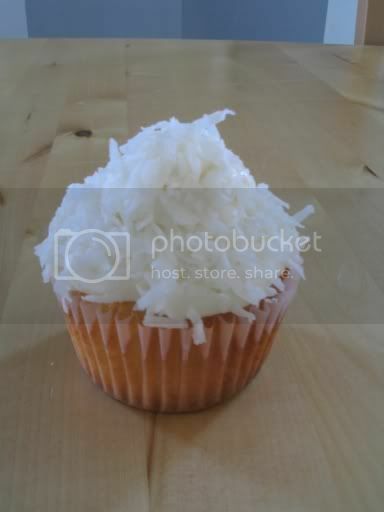 Maybe you could bribe your landlord with some of your delicious goodies to get some more things done around the place. In fact, maybe that's why he is always lingering around-he must smell the wonderful aromas coming from your apartment! Awesome news!! Our home is supposed to be our sanctuary where we can blog and cook to our hearts content...with plenty of light for photos. Congratulations -- clearly you are wearing the landlord down. I hope the shower gets done more quickly than the light in the kitchen! My husband, who has sole custody of Dorie's book, has made her madeleines a few times. They are yummy. I will from now on always think of the mafia whenever I pay my electric bill. I hope you get to shower soon barefoot. Love the cookies. They look so good. 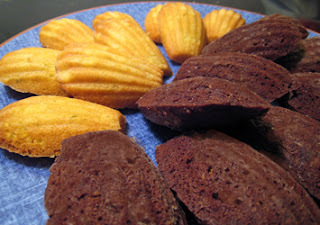 those madeleines are gorgeous.... 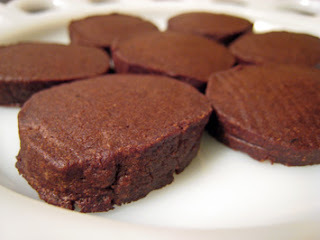 I have to try baking them.... hpefully soon! 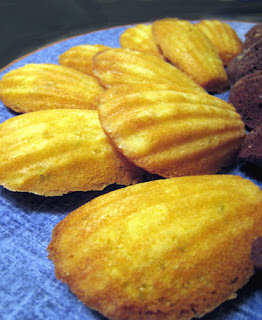 Oooohh, chocolate madeleines with lime zest sound amazing!! I'm glad that you were able to convince him to replace the shower!! As a former renter, I know what a pain it can be. I remember living in the student ghetto in college and our landlord was the dirty version of Mr. Furley. His idea of a working toilet and shower make me cringe now (and even then). I'm glad to hear you'll have a new shower soon. I've been wanting to try Dorie's madeleines for a while. They look delicious. Oh Brilynn, it sounds like the last apartment I was in - I lived on the top floor and one rainy night in winter the roof leaked and my bedroom was completely soaked - bed ruined. As compensation the landlord moved to a downstairs apartment with zero natural light - needless to say I didn't stay much longer in that terrible place! Best of luck with your place, and I'm impressed with all the goodies you're still baking up! Oh, yuck. The whole shower story gave me the willies. On the other hand, mayber you can get an estimate from an electrician about putting light in your kitchen, and present it to the landord, along with a bribe. Hhm, maybe some baked goods? best of luck with the new one, Brilynn! What, you didn't *know* that electricity is run by the mafia? DUH! (haha) Best of luck with the new shower ;). Apartment woes and a nosy landlord who thinks the mafia owns the electric company? Oy! You poor gal, I too would dive into Dorie's recipes for solace. But hooray for your shower being fixed! And as for your photos being a bit dark, you can buy a sunlight simulating lamp at any well stocked photography supply store. I bought mine for about $125, which included the bulb, socket/shield and stand. It has revolutionized my ability to take photos when the sun isn't shining just so! I would have been so miserable! Glad you're finally getting it fixed. Kitchen lights next you think? oh, your landlord sounds like a really annoying man. Glad to know that he is doing something about the shower. Have you tried bribing him with your bakes? Good lord woman! Did you sign a long term lease??? Can you run away?? I hope the mafia doesn't get upset that you're getting a new shower. They might come banging on your door. Or the landlord's. This all reminds me of an episode of Three's Company with Mr. Furley. Those madeleines look good. Perfect form. Makes me happy to know you liked my cakes. 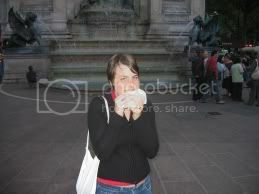 Hey, you LOVE to cook, photograph, eat and write about food, so why worry about profitability. Your blog content is good, so just Go BIG. Fabulous news - 2008 kicks off with a major victory. The cookies look great too and give both comfort/victory eating, but that first new shower without ickiness around you will feel sooooo good. You poor thing! I can relate to your plumbing trials and tribulations, as well as your lighting situation. I've been there and lived to tell about it! Just keep thinking about how nice it will be when you step into that brand new shower for the first time. Oh, and by the way, when you're in Florida visiting Steamy, make sure you stop by to see me too! I feel for you having a landlord like that - he shouldnt be in the business then if he doesnt want to maintain the apartments proper! I'm sure he still makes a profit anyways, some people are just tight! What a great blog. I have been browsing the net in search of feedbacks about the Bath Fitter Company and I learned from www.pissedconsumer.com about the experiences of the customers. They are not that much satisfied with the quality of products and the level of services. I think that your blog is also very informative in terms of the company.